The Odeon 145th Street Theatre was constructed in 1910. The original plans filed with the New York City Dept. of Buildings were for a three-story brick and stone theatre, measuring 55 by 89.11 feet, with a slag roof, limestone cornices, steam heat, glazed terra cotta coping, and wire glass. The owner was Henry Morgenthau Co., 165 Broadway. The architect was Thomas W. Lamb, 224 5th Ave. (Office for Metropolitan History, "Manhattan NB Database 1900-1986," (30 January 2015), http://www.MetroHistory.com ). As built, the theatre is a four-story building. The Odeon 145th Street Theatre was listed in the New York telephone directory from 1911 through 1952. It was called Odeon 145th Street to distinguish it from another Odeon Theatre located at 58 Clinton St., downtown on the East Side. The Odeon Clinton Street was listed in the New York telephone directory from 1911 to 1930. In 1911 the following appeared in the New York Times, 13 August 1911, "The M. Morgenthau, Jr., Company has placed a mortgage of $75,000 at 5 per cent. for five years on the Odeon Theatre, south side of West 145th Street, about 200 feet east of Eighth Avenue. The ground, 75 by 100, on which the theatre stands was purchased from the Henry Morgenthau Company by a syndicate, and the theatre erected from plans by Architect Thomas Lamb. The theatre is fireproof throughout and has a seating capacity of about 1,100. The theatre was opened with moving pictures and vaudeville performances early this year, and has been a success from the start. Title to the property passed to the 145th Street Theatre Company last week for a nominal consideration, and a second mortgage of $51,000 at 6 per cent. for five years was taken back by the Morgenthau Realty Company." Cinema Treasures describes the Odeon 145th Street as follows, "According to the date plaque in the stonework on the upper part of the facade, the Odeon Theatre was built in 1910. It was opened in early-1911 by the M. Morgenthau Jr. Co. and was first used as a vaudeville theatre with motion picture use. The 1,100-seat Odeon Theatre was an early theatre designed by noted theatre architect Thomas W. Lamb. It was leased to the 16th Street Theatre Company in August 1911. It is listed as operating as a full time movie theatre by 1925. For many years it was operated by the same chain that operated the nearby Roosevelt Theatre on Seventh Avenue and the Douglas Theatre on Lennox [sic] Avenue." The organ at what is now (2015) St. Paul's Community Church (former Odeon 145th Street Theatre) dates from 1924. It was originally installed in the City Center at 131 West 55th St. and moved up to 145th St. in the 1950s. More on this is found at http://www.nycago.org/Organs/NYC/. A much earlier organ at the Odeon 145th Street was installed in 1915. This was not in the balcony, but sunk into the stage. "Manager Milton S. Gosdorfer, of the Odeon Theatre, in West One Hundred and Forty-fifth street, New York, has just purchased a $10,000 organ, which will be sunk in the theatre stage. It will be one of the finest organs ever installed in a theatre" (The New York Clipper, 25 December 1915, pg. 112). The website Harlem + Bespoke shows a drawing of the Odeon facade. Cinema Heritage Group posted the following regarding this drawing, "The excellent drawing of the facade is by the remarkable artist and cinema recordist Anthony Dumas." The following was posted on Frank Jump's Fading Ads website, "[Leo] Brecher and [Frank] Schiffman were white businessmen who played a major role in the history of Harlem’s entertainment industry as owner-operators of a number of Harlem’s leading theatres featuring black entertainers. Brecher was owner of several Broadway and Harlem clubs and theatres, while Schiffman was a theatre operator and motion picture distributor. They first became business partners in 1920, converting the Odeon Theatre (1910, Van Buren & Lavelle, 256 West 145th Street) to show motion pictures." This quote can be read in context in the Landmarks Preservation Commission report dated 28 June 1983 at neighborhoodpreservationcenter.org. 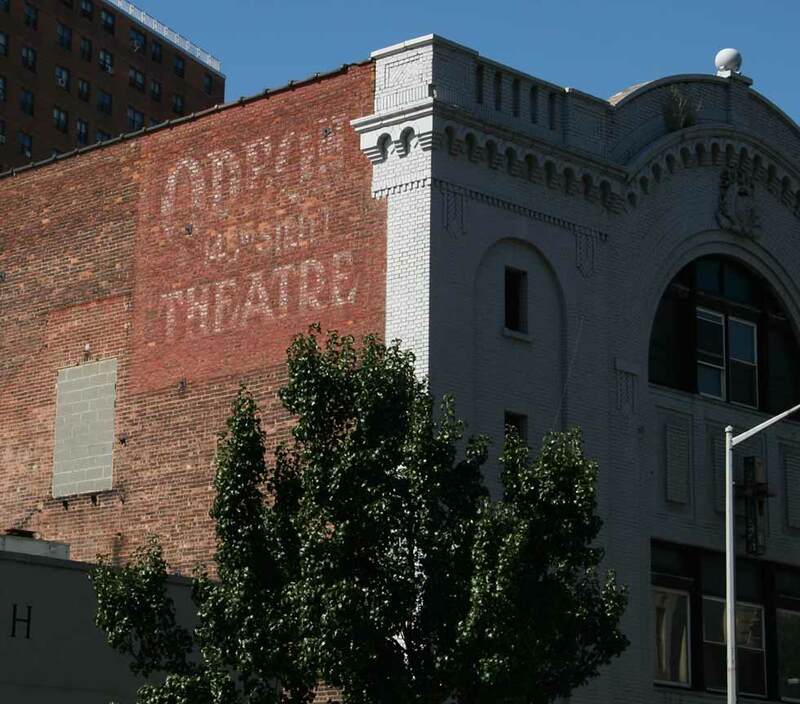 The report dealt with landmark status for the Apollo Theatre on 125th St. Cinema Treasures lists the Odeon 145th Street Theatre among 190 theatres it credits to architect, Thomas W. Lamb. An early manager at the Odeon 145th Street was Milton Gosdorfer (1872-1951). Gosdorfer was a theatre operator, manager and a theatrical agent. This ad for the Milton Gosdorfer Enterprises appeared in Variety, December, 1912. It mentions both Odeon theatres, the one here on 145th St. and the other on Clinton St. Milton Gosdorfer was born in Cincinatti, Ohio, and was listed as a clothier in the men's furnishing business on West 14th St., NYC, from around 1900. In 1919 Gosdorfer was sued as if he were the owner of the Odeon, according to this story in The New York Clipper, 5 March 1919, pg 32, "Milton Gosdorfer, alleged proprietor of the Odeon Theatre, on 145th street, was made defendant in a $5,000 damage suit last week before Justice M. Worley Platzek in the Bronx Supreme Court, brought by George Rubin, for assault committed on him in that theatre on November 6, 1917. The assault was committed by a man named Jack Levy, whom Rubin believes to have been an employe of the theatre, but has been unable to prove that this is a fact as Gosdorfer has refused to affirm or deny it. Furthermore Gosdorfer, through counsel, claimed that he did not own the theatre." Another story from 1919 mentions some other theatres operated by Gosdorfer, "Daly's Theatre, on Broadway, south of Twenty-ninth street, after having been dark for the past two and a half years, has been leased by Milton Gosdorfer, through Carstein and Linelin [sic], Inc., to be turned into a motion picture house. Gosdorfer also operates the Plaza Theatre at Madison avenue and Fifty-ninth street. Although the theatre will be altered and made into an up-to-date motion picture house, the famous old foyers will be preserved" (The New York Clipper, 27 August 1919, pg. 33). This ad for the movie, The Big House, appeared in The New Amsterdam News, 3 Dec. 1930, featuring the Odeon 145th Street as one of its theatres "For Five Thrilling Days."